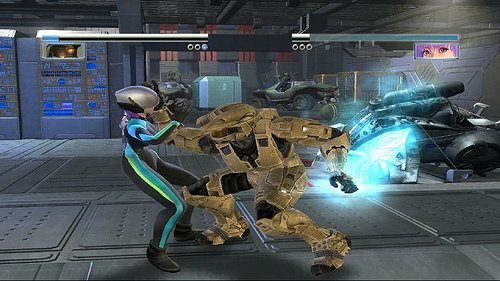 Found some movies of Nicole, the unlockable Spartan 458 in Dead or Alive 4 on the Xbox 360. It looks damn sweet too. I can help but think that this is a shiver of a glimmer of a glance at Halo 3. I. cannot. wait. But I digress. You see a lot in this video, the cool spartan moves (sticking a plasma grenade and using the active camo), the highly detailed models. You even get some 360 degree viewing which shows the Spartan off in all of her shiny green glory.